A brief homily could never do justice to the monumental Eucharist theology of this Great Doctor of the Church. One can pour over his treatise on the Eucharist in the Summa Theologiae, or one can figuratively sit at the feet of St Thomas by reading his magisterial Commentary on the Sixth Chapter of St John’s Gospel, the “Bread of Life” discourse. However, even for St Thomas, theological explanations, in the end, have to give way to poetry, to hymnody, as in the great Eucharistic hymns he composed for the Divine Office for the Feast of Corpus Christi, Adoro te Devote, being among them. Lost, all lost in wonder at the God you are. And in the second verse, we are given the basis, the foundation for our belief in the Real Presence of Jesus in the Blessed Sacrament. Truth Himself speaks truly or there's nothing true. The profound words of St Thomas are most fitting for us today as we listen to the words of John 6 at this Mass. When we encounter Christ in the Eucharist, we are faced with a choice; it is not just to eat or not to eat, but rather to believe or not to believe. There is no middle ground. 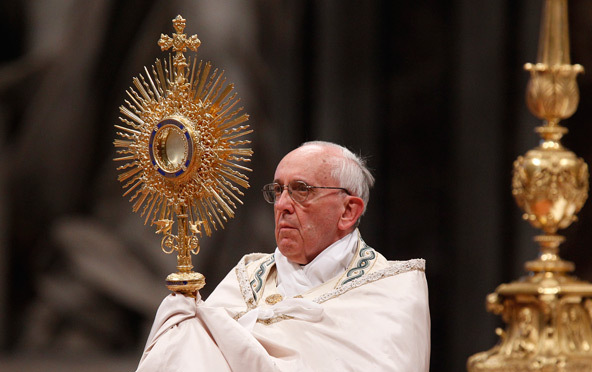 We can’t 'sort of believe' the Eucharist is Jesus’ Body and Blood. And this can put many of us at a quandary, we are either blown away by God’s inconceivable love for us in this Sacrament, or we struggle to understand how this works … and thus, struggle to believe. It is not that we figure out Jesus and His ways, but simply that Jesus is the witness par excellence worth believing. He is the Way, the Truth and the Life. Even if we don’t fully understand all there is to know about the Eucharist, we can fully believe in the Eucharist because Jesus is credible, “Truth Himself speaks truly.” And this is what Truth Incarnate tells us: “I am the Bread of Life.” “This is My Body; this is My Blood.” And “Unless you eat the Flesh of the Son of Man and drink His Blood, you do not have life within you.” And “For my flesh is true food and my blood is true drink.” And you and I have faith in the Real Presence of Jesus in the Holy Eucharist precisely because Jesus told us so. St. Cyril confirms this by saying: ‘Do not doubt whether this is true, but rather receive the words of the Saviour in faith, for since He is the truth, He cannot lie.’ “Truth Himself speaks truly, or there’s nothing true.” If He’s not worth believing then there is nothing worth believing. “All the din and clatter of the streets, all the great factories which dominate our landscape are only echoes and shadows if you think of them for a moment in the light of eternity; the reality is in here, is there above the altar, is that part of it which our eyes cannot see and our senses cannot distinguish. . . . When death brings us into another world, the experience will not be that of one who falls asleep and dreams, but that of one who wakes from a dream into the full light of day. Here, we are so surrounded by the things of sense that we take them for the full reality. Only sometimes we have a glimpse which corrects that wrong perspective. And above all when we see the Blessed Sacrament enthroned, we should look up towards that white disc which shines in the monstrance as towards a chink through which, just for a moment, the light of the other world shines through”. Glory and praise to you Lord in the Blessed Sacrament of the altar. God bless you, Father Michael.